Competing road maps in the Catalan family: get over it! On the last two Tuesdays, Catalan President Artur Mas and the ERC leader Oriol Junqueras offered opposing views on the best way forward for Catalonia's independence process. Each presentation was given to a crowd of supporters, and each attended the other's speech. You can read my live-tweeted, translated version of their presentations here and here. The Catalan President gets up on stage, suggests a single party list with a mix of politicians and community representatives with a single objective: the independence of Catalonia. He says it's time to take the long view, put local politics on hold for 18 months, and tackle the construction of the necessary state structures for the new Catalan Republic. In order to prove his 'sense of country', he offers to give up top spot on the list, and be last instead, and promises as well that he will not run again for presidency after independence. Critics say he's protecting himself and his party by insisting on unified list, that it's impossible to create state structures within Spanish State, and that you can't preach unity if you appear solo on stage. Pretty much all of the other parties have already rejected such a unified list, and we're left wondering who would join. Catalan Republican Left leader Oriol Junqueras takes the stage a week later, espousing value of diversity, and suggests joint campaign, platform plank for independence, community representation, Executive, and name prefix but separate lists. Says this is the way to make sure not a single pro-independence vote is lost. Critics say he's protecting himself and his party by insisting on separate lists, that it's impossible to achieve clear democratic mandate without unified force, and that you can't preach unity if you appear solo on stage. It's not at all clear if other parties would be able to agree on single independence plank, and thus we're left wondering how we (and the world) would know which votes were for independence. Meanwhile, the people look on with increasing frustration. Scuttlebut points to lots of backstory and old wounds that have never healed. Accusations fly and many are true. This party was in power for X years and never lifted a finger for independence. This party made Y deals with this Spanish/pro-unionist party to save their own power. This party hasn't fulfilled commitments to create state structures. This party has taken advantage of the moment while we take our political lumps. It's like watching siblings fight: she hit me first, he called me names, she thinks she's better than me, you love him more. We the people are the parents. First, no hitting, use your words. Next, remember that it's not just today, the back story exists. We got to this point because of all that has gone before. No one is blameless, we are all responsible. Be generous. And if you can't figure it out, we parents will have to step in. We'll hold your hands and show you just what we want you to do: win independence. Now, go back to your room and don't come out again until you have a plan that you can present all together. You've got until dinnertime. El president català, Artur Mas, surt a l'escenari, suggereix una llista unitària, amb barreja de polítics i representants civils amb un sol objectiu: la independència de Catalunya. Diu que és moment de mirar a llarg plaç, de posar la política local al congelador 18 mesos, i posar mans a la feina de construir les estructuras necessàries estatals per la nova República Catalana. Per evidenciar el seu sentit de país, ofereix deixar espai a dalt de la llista i ocupar l'últim lloc, i a més promet que no tornarà a presentar-se com a president desprès d'assolir la independència. Els crítics diuen que es protegeix a ell mateix i al seu partit insistint en una llista unitària, que és impossible crear estructures d'estat dins l'Estat Espanyol i que no es pot demanar unitat apareixent solet a l'escenari. Pràcticament tots els altres partits ja han rebutjat la llista unitària i ens queda el dubte de que s'hi apuntaria. El líder d'Esquerra Republicana, Oriol @Junqueras surt a l'escenari una setmana després, explicant com és de valuós la diversitat, i suggereix una campanya, un punt sobre independència, representació civil, un govern, i una part del nom en comú, però llistes separades. Diu que aquesta és la manera que assegurar-se que no es perd ni un sol vot independentista. Els crítics diuen que es protegeix a ell mateix i al seu partit insistint en llistes separades, i que és impossible aconseguir un mandat democràtic sense la força unitària, i que no es pot demanar unitat apareixent solet a l'escenari. No queda clar si els altres partits es posarien d'acord sobre un punt comú sobre independència i ens quedem preguntant com sabríem (nosaltres i el món) quins vots serien a favor de la independència. Mentrestant, la societat civil observa amb frustració creixent. Les xarxes i les veus en off senyalen molta història i ferides velles que no s'han curat mai del tot. Les acusacions són múltiples i algunes sabem que són verídiques. Aquest partit estava al poder durant anys i no va aixecar ni un dit per la independència. Aquest feia tractes amb els unionistes per protegir-se els escons. Aquests no han complert amb les estructures d'estat. Aquells se n'han aprofitat del moment mentres menjem els gripaus. Ad infinitum. És com veure germans barallant-se: ella m'ha pegat primer, ell m'ha dit paraulotes, ella pensa que és millor que ningú, tu l'estimes més a ell. 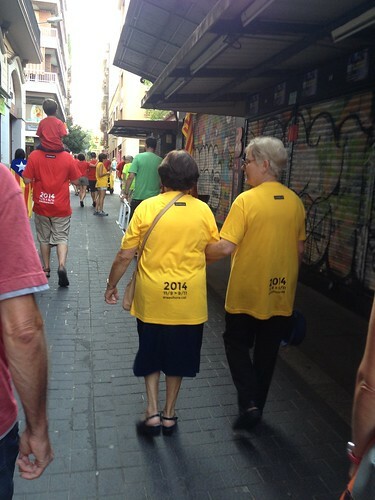 La gent som els pares d'aquests nens. Primer, no us pegueu, feu servir les paraules. Ara, recorda que no només és el que ha passat avui, la història existeix. Hem arribat aquí per tot el que ha passat els altres dies. Ningú és totalment net, som tots responsables. Sigueu generosos. I si no podeu ser generosos els uns amb els altres, els pares haurem d'intervenir. Us agafarem per les mans, i us ensenyarem exactament el que volem que feu: que guanyeu la independència. Va, cap a l'habitació i no torneu fins que tingueu un pla que podeu presentar tots junts. Teniu fins l'hora de sopar. Catalonia's President Artur Mas called a press conference at 6:30pm this evening in the Catalan Government Palace of the Generalitat to respond to the announcement by the Spanish Government that it would bring legal challenges against the new formulation of Catalonia's "participatory process" to ask the people their opinion on their political future. Here is a video of the full press conference, mostly in Catalan, with a few Spanish questions near the end and one question (and answer) in English at 1:01:22. I'll start with a rough translation of the introduction, which explains the general reaction to the Spanish Government's actions. I then live tweeted the central portion of the press conference, and finally offer a transcript of the English question at the end of this page. I'll try to be brief so that people can go on with their preparations [for the holiday tomorrow]. But it seemed necessary to respond to the fact that the Spanish Government has presented a new legal challenge before the Constitutional Court, and explain what that means, and what decisions we've made about it. The first thing I'll say is that on October 14, I announced two significant decisions: first, that we would not apply the decree convoking the consultation, that I myself signed, because of the legal challenge that the Spanish Government had brought before the Constitutional Court. I said we wouldn't apply that decree, even though we wanted to very much. 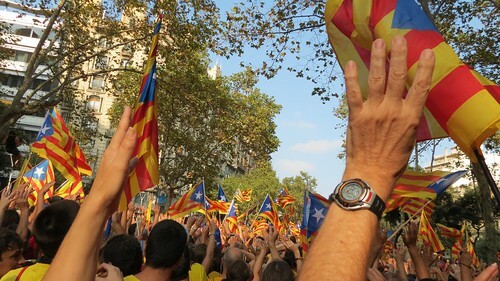 And the second decision was that we would continue forward with respect to November 9th, with a participatory process, with the same aim of finding out the opinion of the Catalan people about their political future, based on the powers that the Catalan Government has with respect to citizen participation. So, therefore, the consultation that was to be called with a decree was substituted by a participatory process, that as you know is in full swing, with many decisions already taken, and that has the same objective, which is to know the opinion of the Catalan people with respect to their political future. 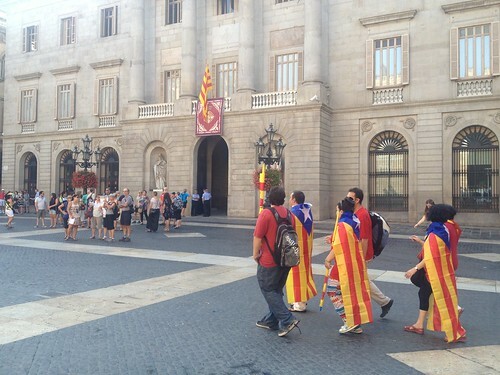 But in this case, based on general powers of the Generalitat de Catalonia with respect to citizen participation. The central government celebrated, at that time, two weeks ago, the suspension of the decree. I remember it perfectly. With grandiloquent words. They even lauged at what we were trying to do. They made fun of it in public. They said it was a fraud, a happening, they used a long series of descriptions to belittle what we had announced as a substitute of the decree that could not be applied, and the intention of keeping on with November 9th as a participatory process. I want to make it clear that after this first reaction of the Spanish government, two weeks later, they have gone from making fun of it, to bringing a legal challenge before the Constitutional Court. That is, they have crossed the line of ridiculousness. When a government, the Spanish State, two weeks ago, laughs at what we're doing, ridiculizes it, publicly, makes a big joke out of it, and then only two weeks later presents a challenge to the Constitutional Court, it's a government that has clearly crossed the line into ridiculousness. If what we are doing is so serious, why wasn't it so serious two weeks ago? On October 14, I explained exactly what we were going to do, and that is exactly what we've done. If that was so serious as to warrant a legal challenge before the Constitutional Court, why did they take two weeks before making any decision, meanwhile laughing at us, making fun, ridiculizing us? In addition, besides being ridiculous, the Spanish Government is abusing its power, and abusing the law. Both things at the same time. It is using the Constitutional Court improperly and incorrectly. Giving it a role that does not correspond to it. It is not the role of the Constitutional Court to resolve political conflicts and a court like the Constitutional Court should not be used to solve problems that others cannot solve. These actions make it clear that the Spanish Government is incapable of solving its own problems politically without presenting legal challenges before the Court which hide the inability of the Spanish Government to find solutions to problems it is faced with. By doing so, I think the Spanish Government uses the Consitutional Court in an almost obscene fashion, because it doesn't make sense to use the court this way, nor is there any reason to do so. Q: What is the vision that the outside world has right now of the Spanish Government? #CatalanPresident: I don't know what the opinion is in foreign countries. This is something you have to ask other people. But my impression is that probably in the world they can realize that the Catalan people want to vote. We have the will to vote. We have the will, the real and strong will to decide our political futre as a nation, as a country. This is the reality. And this is something that all the people in the world should know. And we are trying to do so. We have very big difficulties, very big difficulties because it is almost impossible to sit at the table with the central government and agree to terms for the consultation in Catalonia. We have recent events in this sense, recent examples: what happened in Scotland some weeks ago. There was an agreement between the Scottish Parliament and the Scottish leaders and the British Government. And the British allowed the Scottish to vote. The British allowed the Scottish to decide their political future. And the British won! But that's democracy. You can win and you can lose. This is real democracy. And there is a lack of high-quality democracy in Spain. As you can realize, because although the Catalan government and the Catalan institutions are doing their best in order to reach agreements with the central government in order to sit at the table to try to reach these kinds of agreements, it is not possible, because they say No to every proposal, to every suggestion we send from Catalonia. There are four political formations, two coalitions of two parties each, plus two additional parties, that are trying to negotiate the celebration of a vote on Catalonia's political future. These are CiU (CDC + UDC), ERC, ICV+EUiA, and the CUP. All 6 parties had agreed on Dec 12, 2013 on the question and date for a Catalan vote: "Do you want Catalonia to be a state?" and "If so, do you want it to be an independent State?" and November 9th, 2014. There were several attempts at having a legal referendum. But they died quickly. The Spanish Constitution doesn't really allow for binding referendums, and it also states that referendums about important topics must be voted on by entire Spanish electorate—and suggested from Spanish Congress, neither of which are real options. A large majority of the Catalan Parliament voted in favor of going to Madrid to ask for power to hold a real referendum (and this caused much strife within the Catalan Socialists). They went in April and their request was roundly rejected. Spain's PM Mariano Rajoy also refused to consider any kind of legitimate referendum on Catalonia's future. Next piece of plan was to pass a Catalan Law of Consultations (not referendums, and thus not conflicting with Spanish Constitution), which happened on September 19. Laws in Spain don't go into effect until they are published, so the Catalan Government delayed the laws' publication for another week to try to gain time before Constitutional Court could suspend it. A little chess playing. So, Saturday, September 27, the President signed a decree convening the vote on November 9th. Saturday afternoon, the first advertisements began to run on TV and appeared in the paper. On Sunday morning, the vice president held a news conference to explain the preparations being made to hold the vote, including how the electoral rolls were going to be generated, who would be called to vote, where the polling places would be, who would organize them, what the policy for foreigners was, and so on. The Spanish Government, immortalized in Mariano José de Larra's "Vuelva Usted Mañana" [Come Back Tomorrow] miraculously held an emergency Executive Council meeting on an unheard of Sunday evening, a Cabinet meeting on Monday morning, filed the complaint about the Law of Consultations on Monday, and by Monday evening the Constitutional Court had met and accepted the review of the law—which resulted in its immediate suspension. They also wrote that any preparation of the decree which convened the vote were unlawful. This was backed up a few days later by the Spanish Delegate in Catalonia's letter to each and every municipality warning them that any actions they took in defense of the vote were against the law. The Catalan Government immediately suspended all preparations for the vote, which was to take place just six weeks later. The TV spot was changed, with a blacked out screen and information about the suspension instead of the vote. The foreign registrars were closed, ostensibly to shield civil servants from legal jeopardy. Given the short period of time in which foreigners had to register (from Oct 1-7), there was considerable consternation that they would not be allowed to vote. The Catalan Government was frankly unhelpful in providing timely, complete information about how that would be resolved. They finally decided on October 6 that they could skirt the law by using a different law that gave them the right to attend to all citizen petitions and thus accept the foreigners' petitions without officially saying they were enabling them to vote. Those of us with ties to foreigners' communities frantically passed information around the internet in an attempt to apprise them of the situation. The Catalan Government also voted to designate the members of the Electoral Commission—after the suspension. President Mas signed the decree. I heard that everything was prepared beforehand so that no clerk had to be involved after the suspension. For the cherry, Judge Santi Vidal, who had admitted several months earlier that he was working on a sample draft of a future Catalan Constitution in his spare time, was ordered before the General Council of Judicial Power (CGPJ) in Barcelona and threatened with suspension for six months because of his writings. Though a few days later they voted 3-4 to not yet discipline him, the matter will continue through the court system until a final ruling is made in six months or so. All of these prohibitions and loopholes have generated an aura of confusion and disarray and frustration. This was somewhat allayed by the overwhelming display from 920 out of 947 Catalan municipalities—a whopping 97%—voting resolutions of support for the November 9 referendum. And then the good dissipated somewhat as Joaquim Brugué, the Electoral Commission member nominated by ICV, resigned after two days on the job decrying the lack of "democratic guarantees". He did not elaborate, though he did complain a lot about the reaction he got on Twitter. And then the summits began. On Friday, October 3, the first summit meeting took place with representatives from all six parties. Journalists camped out all day around the Catalan Government Hall (Generalitat) but when they emerged that night and one after one promised that they were still united, you could almost feel the relief on Twitter. The spectre of the splinterization of Catalonia's left that Orwell wrote about still haunts people. There's also a general feeling that Catalans are defeatists conditioned by years of Barça losses and more years still under Spain's control. Unity is a big issue. There was a second summit without the declarations, and then yesterday there was a third, in an undisclosed location which was quickly disclosed by journalists climbing trees (Hi, Quico!) At the end of this last summit, we learned that ICV had left early, that the unity had been broken, and that the Government and Mas had called off the Nov 9th consultation. Well, that's what Twitter (and the AFP) said. But it wasn't quite true. ERC released a four point statement and the CUP held an impromptu assembly in the middle of Sant Jaume Square (at 11:30pm) which attracted 500 people in less than half an hour. They described what had happened in the last summit: that the Government had proposed changing the consultation to a "participatory process" based on existing Catalan law in order to skirt Constitutional Court suspension. The CUP reported excess partisanship but said the game wasn't over. Mas scheduled a press conference for 10am Tuesday morning. I collected viewpoints and information from many major sources. At 10am Tuesday, President Mas explained that going up against the Constitutional Court was like bashing one's head against a wall, and that only result was getting a headache. He preferred bypass Court by not using the suspended law and suggested that consultation rely on existing Catalan law (which he refused to name so as to not "make it easier for Spain"). He said that consultation was never meant as definitive answer, and since in Spain a negotiated binding referendum was not possible, the only definitive answer could be found in a plebiscite with a single unitary list encompassing all pro-indy parties. This is something new that he hasn't said before. He had only mentioned a plebiscite as a last resort to having Catalan people vote, but this was the first time he said it was a necessary step. • Instead of using existing electoral rolls, voters will register (with official ID) at the door on the day of the election. The President suggested that this might even enable more people to be able to vote, including Catalans who are currently registered in Catalonia but who live in other parts of Spain. The President mentioned that electoral rolls were a big issue and that he was worried about violating data protection laws by using existing census, given the suspension. He said if people who didn't want to be on the lists began to sue the government, it would cause international embarrassment. • Instead of randomly selected citizens to serve on official electoral tables at polling places, the President said the government would ask for the support and help of 20,000 volunteers. They decided to use Catalan Government buildings for polling places to bypass any issues with local municipalities who didn't want to participate (as is the case of three or four large towns in Barcelona's industrial belt). You can read my full account of President Mas' press conference here, including his answer to my question about how referendum/consultation confusion would play out internationally. He didn't answer my or others' questions about who would be on unitary list that he proposed for plebiscite. Joan Herrera, one of the co-leaders of ICV, the eco-socialist Green party held a press conference in the middle of the day. He said the new formulation converted the vote into nothing more than a 'happening' or an 'event' that was designed solely to "rescue Mas' himself and his promises". Herrera's coalition partner Joan Josep Nuet echoed his sentiments. Trying to get a handle on people's reaction to the news, I asked a few questions on Twitter. One in particular resonated: Are you more disappointed with lack of unity or with different formulation of the consultation. You can read the answers here. Finally, Oriol Junqueras, the president of Esquerra, made an appearance at 6pm to explain his party's reaction. He said that the Government had broken the unity of the parties in favor of the referendum and he asked them to go back to the earlier formulation in order to restore that unity. He repeated Mas' assertion that the real adversary was the Spanish State, not the other Catalan political parties. And though he insisted that best option was for the Catalan Government to return to united position with existing pact, and lamented that it was hard to trust people who didn't keep their promises. He also said that he and Esquerra would continue to help the Government in any way it could. It was the biggest anti-ultimatum I've ever seen. It is clear that Junqueras will do whatever necessary so that a referendum is held. He also said that the main priority was helping the Catalan people, the only way to do that was with independence, and that is why the referendum is so important. Junqueras pointed out two major differences between old and new formulations for the consultation. First that with the first method, which follows the regular election process, there would be 4000 polling places, while in the new model there would only be 600. He also said that a 'participatory' process does not result in a democratic mandate, and that it would be better to maintain original model, which did. Question: International community is already somewhat confused about difference between "referendum" and "consultation", and now you are proposing this third option, that, if I understand correctly, is preliminary answer to "definitive" referendum which you said could only be result of a plebiscite election. How will you explain this to international community? #CatalanPresident Artur Mas "Some months ago, we asked the Spanish Government to allow a referendum in Catalonia and they were not willing to accept a referendum in Catalonia in agreement with Spanish institutions. After that, we decided to pass a law on consultations in Catalonia. We approved it some weeks ago, and I signed the decree to hold this consultation. "A consultation is not exactly the same as a referendum. Well, it is more or less the same. In fact, the final purpose is to know the opinion of the Catalan people. And this is something that you can organize through a consultation or through a referendum. This is what we are trying to maintain for November 9, to maintain this consultation, so that people will be able to go to the polling stations and vote. We'll have to change the way to do it. But the aim is exactly as before, to know the opinion of the Catalan people, about the political future of Catalonia according to the two-part question that was agreed on some months ago. So this is also a consultation but held through other ways. "And my final statement would be that the definitive referendum in Spain can only be held through elections. In other parts of Europe and the world, there are other possibilities of doing that, other chances. For example in the UK, the British government accepted negotiations with the Scottish government to agree on the terms of the referendum in Scotland. But that is something that is not possible in Spain. It is just not possible. It's a pity of course. It's a big pity but that's just the way it is. That's just the way it is. Unluckily. 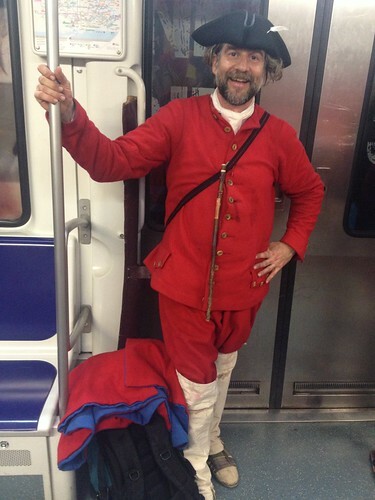 "So, in the Spanish State, the only way to hold a definitive referendum is via elections. In my personal opinion, in order to make sure that the international community will understand the outcome of this referendum well through or via elections, the only way is with one list and one program. And if this list, and this electoral program shapes the absolute majority in the Parliament, then the outcome is clear: the referendum has been won. Originally published in ARA. Translated and republished here with permission. In 1939 the building located at 30 Carme Street in Barcelona was burning. On Xipreret street in L'Hospitalet de Llobregat (just south of Barcelona), there was a bonfire of books. In Terrassa, Figueres, Sénia, Blanes, Cervera, Igualada, Golmés, Móra d’Ebre, Sant Boi, Lleida, Sallent, Gandesa, la Fuliola, Palafrugell, Mataró, Ordal, Sitges, Caldes de Montbui... Let's stop. Our fingers can't go so high. Burning. And among them, the pyromaniacs of plunder: the DERD (State Delegation for Document Recovery). From January 28 to April 3, 1939, 1,690 searches. 25 each day. 160 tons of documentation was the bounty of war. Just in Barcelona. We don't know anything else. We don't know anything. They took it all away: papers, documents, books, frames, tables, chairs, bank accounts... Everything. They occupied buildings, properties. They persecuted, repressed and eliminated people. They performed arquitectural lobotomies. In Igualada they called it National Center. In L'Hospitalet, the Falange headquarters. In Caldes de Montbui, the offices of the Social Aid. In Sant Cugat, in Canet de Mar, in Alforja, in Llagostera, in Sant Adrià, in Masquefa, in Sant Pere de Ribes, in Guiamets... Stop. Some have died. Others limp, or have just one eye. And many have resuscitated. We don't anything about the athenaeums (community centers), the cooperatives, the associations that were smothered in 1939. The athenaeums are the lungs of the country (today there are about 400). An oxygen pump against asphyxiation. Catalonia begins to breathe in the 19th century. In each town an athenaeum is born. They formed, educated, taught... They were the school, the university, for the Catalan people. They supplied what the State did not provide. Catalonia is a pioneer in creating a state without having a state. This artificial existential respiratory system. The athenaeums of the left, of the right, of the republicans, of the anarchists, workers, conservatives, spiritualists, naturalists... Athenaeums like the one that burned on 30 Carme Street: the Popular Encyclopedic Athenaeum. 25,000 members. They offered from hiking excursions to Esperanto and had night classes for workers. Athenaeums that were left without books (2,500) like the Popular Culture Athenaeum on Xipreret Street in L'Hospitalet: dances, French classes, drafting, calculus, chemistry... Centers like the CADCI (Autonomist Center of Commercial and Industrial Clerks). 20,000 members. It suffered the second worst sacking after the Generalitat: 169 sacks of documentation, 55 buildings decommissioned and dozens still not located today. Popular Athenaeum of La Garriga, Catalan Athenaeum of Sallent, Acàcia Athenaeum, Athenaeum of Sant Just, Foment Martinenc, Societat Unió Gandesana... We can't stop. We're starting to count. After 75 years, we have a first listing. About 70 athenaeums and associations all over Catalonia could be affected by the smothering of 1939 according to the Athenaeum Network (XarxaAteneu). The figure could double, triple... We don't know anything. The documents, the buildings, the objects, the money, it's all simply unquantifiable... This Saturday at the Barcelona Athenaeum there is a zero moment to begin to breathe: the Table of Entities Affected by the Francoist Regime. We need to know. We need oxygen. The asphyxia of 1939 is also the asphyxia of 2014. The same day (Tuesday) that the Partido Popular once again asphyxiated us as it rejected the return of more of the "Salamanca papers", Teresa Rovira stopped breathing. The librarian who saved pieces of the country by hiding Catalan books in the "hell" of the library. The children's books: the spark of life. The daughter of journalist and politician Antoni Rovira i Virgili. The 95-year-old woman died without being able to recover part of her father's archive. They have burned us, they have stolen our ashes, and the coffin, the tomb, the stone, the niche and the flowers. We are in a place that has no name. And we are not here for 16 billion euros. We are here because we have nothing. We are here because of a cry that doesn't die: we have no papers, no stones, stained with our tears. By Anna Murgadas. Originally published in Nació Digital. Republished here in English with permission. Concepció Soriano (Barcelona, 1941) is a grandmother and a human tower builder, and member of the Castellers de Barcelona team. Her job as a human tower builder is to serve as a "plug", that is, to fill the holes that are left in the base of the tower between the radial spokes. As far in as they need her, she says. 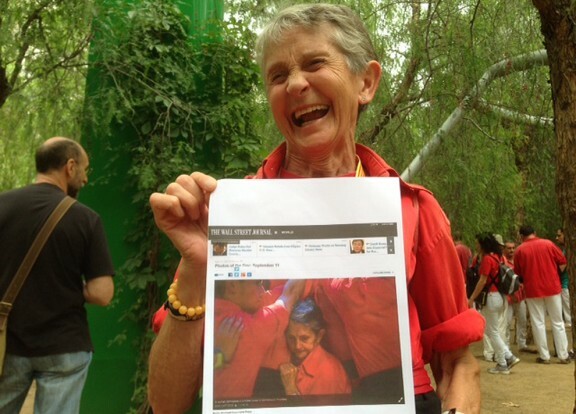 This September 11th, her picture went around the world as the image of Catalonia's National Day. She was one of the Wall Street Journal's photographs of the day. Did you imagine all this fuss? Who told you that this photograph had come out? People were calling me all day on Friday, but I was very busy with my grandchildren since school hadn't started yet and I didn't pick up the phone. In the evening, when I got to Castellers practice, my team members were waiting for me in the street. I was very touched. Everyone was hugging and kissing me! It was really amazing, to tell the truth. And when you saw the photograph, what did you think? But it's not just that you're the face of Barcelona's human tower building team, the Wall Street Journal chose you as the symbol of Catalonia's V for Vote demonstration! Well, that makes me very proud at my age. I'm 73, I won't fool you. I called my son-in-law, who's studying in the US and who knows that country well. "Of course I know what paper it is!" he told me. And how did you celebrate the day? We were at the vertex of the V. I went with a friend to hold the banner for the Barça booster club, but I left her for a moment because they needed me for the tower. It was awesome, really nice. I hope we win! On November 8th, my daughter is getting married and it would make me really happy to go vote the next day. Have you been part of the Castellers de Barcelona team for a long time? No, no. About six years. Apart from being on the human tower team, I'm a volunteer, since the 92 Olympics. I made a lot of friends there who were human tower builders and after seeing them during the festivals so many years, I decided to join. What's your job on the team? I'm a plug, I fill in the holes that remain in the base of the tower [between the spokes], and since I'm really small, I can get really far in. Yes, when I went to practice, I brought her with me and she just played. But then I saw that she liked it, and she wasn't afraid, and pretty soon she was climbing pillars (one-person-per-storey towers). I signed her up but now she is six and I don't know if she'll want to keep doing it. What did she say about the photo? Oh, she just got home from vacation and hasn't seen it yet. This article was written by Manuel Cuyàs in El Punt Avui. He kindly agreed to let me publish this translation here. I go into Barcelona to participate in the V demonstration, and after wandering about the Arc de Triomf for a few minutes, I find my cousins from Tarragona. I tease them: I thought you wouldn't miss the meeting of unionists in the amphitheater. 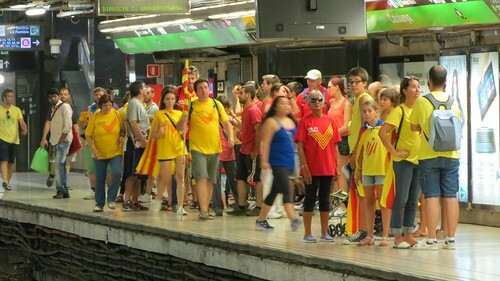 The unionists hope to convert Tarragona into Àlaba, the most Spanish and castilianized of the Basque provinces, but seated in the stands of the amphitheater, they look much more like schoolchildren on a field trip. Afterwards, I find other cousins and acquaintances and also people I'm not acquainted with at all, as I make my way around the Born, the Fossar de les Moreres, Argenteria street, the Plaça de Sant Jaume, Ferran street, the Plaça Reial, and the Rambla. The impressive photographs of the V will overshadow these other, previous human compositions: people dressed in yellow and red filling restaurants at lunchtime, going in and out of cafés, walking up and down the streets. Today, if you get or give a shove to someone walking by, people are smiling instead of grumbling about where you think you're going. Everyone knows where they're going and is aware that the concentration that awaits them for the afternoon will involve lots of bumping into each other. There are a lot of us and we don't fit in Barcelona. 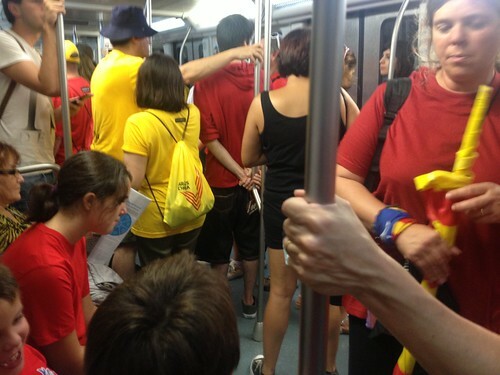 The organization, the ANC and Òmnium Cultural, had said that at 4pm, one hour before the climax at 17:14h (5:14pm), everyone has to be in his or her place on the Gran Via and Diagonal. We must be the most disciplined people in the world because between half past three and quarter to four, all of us who had been wandering aimlessly around the streets begin heading to the meeting points. We are moved by discipline and something more: appreciation for the organizers who had thought of everything and foreseen every possibility. We can’t let them down. To organize much less complicated things, others contract specialists and outside experts. The V requires a profusion of trains and buses, calculations, t-shirt sales, the willingness of men and women to form the four bars of our flag, all of which is the product of the work of many volunteers. I thought that waiting for an hour in the hot sun was going to be a drag, but I hadn't counted on my cousins, acquaintances and non-acquaintances who made it a breeze. Five, four, three, two, one... 17:14. The unanimous demand: "independence". Polls say that 75% of Catalans want to vote. Here, with almost 2 million people, that's 25% of the population. I don't know what the others—the ones who at that moment were at the beach, at home, or on a walk—plan to vote. The ones on the Gran Via and the Diagonal want to vote Yes for independence. The ones who simply don't want to vote were in Tarragona's amphitheater.